As any parent knows, dealing with a sick child is not fun at all. Especially when they’re infants, who can’t even express how they are feeling or what they want in words that we can understand. And for parents, one of the biggest challenges can be getting them to eat something when they don’t feel like it. 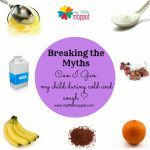 Dealing with a cough and cold has it’s own issues, since the throat is all itchy, the nose is runny, and the child probably finds it hard to breathe, let alone eat. You can try some home remedies for cough and cold to get some relief. 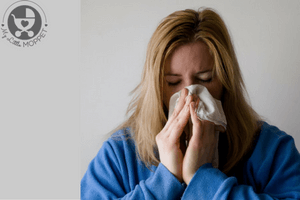 You can also try a DIY Ayurvedic oil for cough and cold. In the meantime, the lack of appetite may also be accompanied by nausea. And when kids sleep for longer hours, you don’t have too much awake time left to feed them. The WHO recommends exclusive breastfeeding for the first six months of a baby’s life, so infants of this age need nothing other than breast milk – not even water. For babies and older children, offer them small quantities at regular intervals, but don’t force it on them. Try to choose foods that they like so that there’ll be the least resistance on their part. 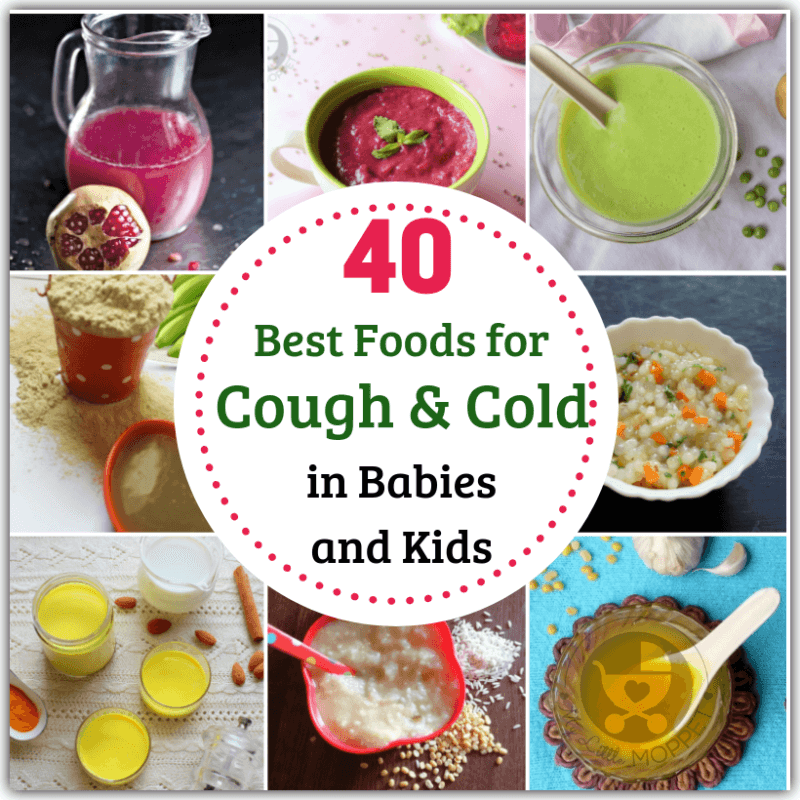 To make life easy for you, we’ve put together 40 of the best foods for cough and cold in kids – from infants to toddlers to older kids. Do check the age recommendation on each before offering it to your child. Breast milk is the best thing you can feed your baby when she’s sick, regardless of age. Breast milk has the power to transform itself into exactly what the baby needs at that current stage, and no food or medication can match that ability. So if you’re breastfeeding your child, continue to do so on demand. 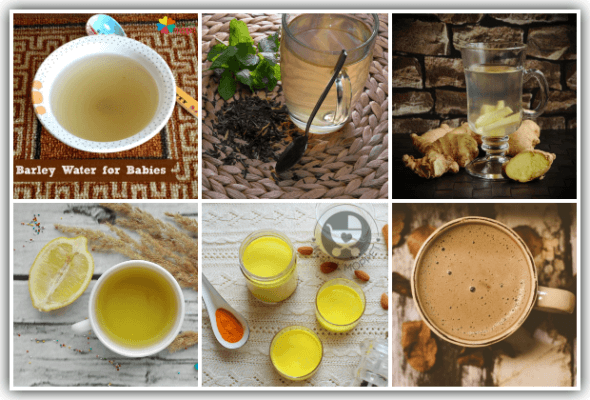 Even if the child has started weaning, he or she may want to feed more than usual when ill.
With lots of vitamins and minerals like calcium, iron, zinc, magnesium and copper, Barley water is one of the healthiest drinks to feed babies. It’s anti-oxidants and phytochemicals offer relief from illness without upsetting the digestive system. Tulsi, or Indian basil, is a natural adaptogen, which helps the body fight any kind of stress, including that of cough and cold. Boil a few tulsi leaves in half a liter of water for 3-4 minutes. Cool, strain and offer your child the water. Ginger is known to be a natural antiviral, and even the smell can be soothing. It aids in inducing perspiration and thus lowers the body temperature in case of fever. A warm ginger tea can also act as a decongestant. Honey is one of the most medicinal foods in your kitchen and one of the main components of several cough syrups. Honey coats the throat and soothes the itchiness brought on by an infection. Warm water with a squeeze of lemon and a spoon of honey can be offered to kids above one year. Also known as liquid gold, turmeric milk is an age-old remedy for several illnesses, including cough and cold. A cup of spiced turmeric milk or ‘golden latte’ can relieve cough and offer an overall feeling of wellbeing. This is probably one remedy all kids will happily consume! Cocoa contains flavonoids, with darker cocoa containing more antioxidants, almost two to three times that of green tea. Add to its healing power by adding some powdered cinnamon to the drink. When babies don’t have an appetite and are cranky, rice soup acts as the perfect remedy. It offers the fluids the baby needs as well as energy to help the baby get better. Its bland taste also works well for kids who can’t handle anything strong when ill. 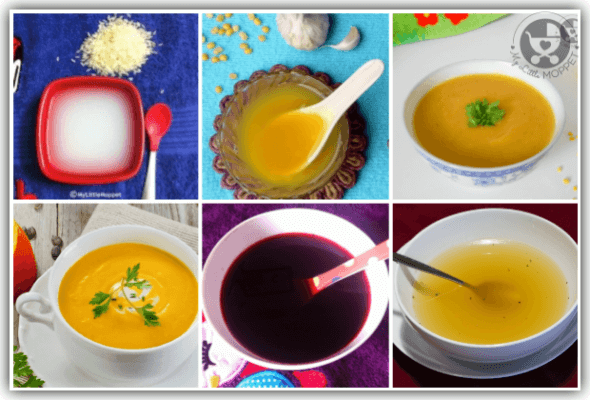 Along with rice soup, dal ka paani or lentil soup is perfect for a cough, cold or fever. Garlic has antioxidant and antiviral properties which help prevent infections and speed up the healing process. 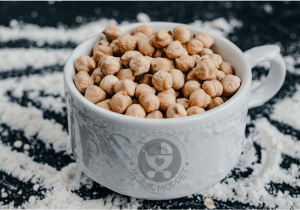 Moong dal or mung beans are one of the best plant sources of protein, containing essential amino acids that the body doesn’t naturally produce. These proteins play a crucial role in illness recovery. This soup is the best way to give babies the healing power of moong dal along with the added nutrition of vegetables. The humble pumpkin is famous for its immunity boosting benefits, but it’s also ideal to have while suffering from a cough or cold. Pumpkins are rich in beta-carotene, an antioxidant that can fight disease. It’s also rich in fiber ensuring that baby’s digestion moves along smoothly even while ill.
Root vegetables in general are popular for their rich vitamin content, like A, B and C. All these help fight infection and boost immunity. Beetroots are packed with antioxidants and carrots have the valuable beta-carotene. Together this soup is perfect for a sick child. Chicken soup isn’t just good for your soul, it’s also the ideal food for cold, cough and fever. Chicken broth helps to fight inflammation that causes the congestion and sneezes typical of a cold. Chicken soup thins mucous and helps free up the nasal passage. Mutton soup or paya has been used to treat cold and cough for generations now. Making the broth helps to release valuable minerals like calcium, magnesium, phosphorus and others, which can be easily absorbed by the body. They also release elements that help fight inflammation. GK Food Diary has a good recipe ideal for babies and kids. With a single tomato providing 40% of the RDA of Vitamin C, it is a vegetable that can’t be missed out on during a cold or cough. In addition, it contains Vitamins A and K along with potassium and iron that ensure good circulation. When your little one is up to eating something a little heartier than plain liquid, this mixed vegetable soup will do the trick. Packed with the combined antioxidants and minerals from different vegetables, it also provides some energy and fiber. Broccoli is a super-healthy vegetable full of vitamins and minerals, including folate. It also provides collagen which helps in healing. Mushrooms provide valuable Vitamin D, which many kids are lacking in. Since these vegetables can be difficult for young children to eat as is, this soup is the perfect way to help them get these benefits. Fenugreek is an excellent healing spice that eases digestion, reduces fever and also soothes aches and pains that may result from frequent bouts of coughing. Combined with the protein and fiber of red lentils, this soup can work wonders on sick kids. This soup combines the best of two valuable ingredients – the beta-carotene rich pumpkin as well as the protein-rich red lentils. Protein is crucial to help rebuild cells and aid recovery, and this soup is an easy way to feed children protein. Spinach is one of the richest plant sources of iron, which is important for healthy blood cells. Spinach also contains high amounts of Vitamin K, probably more than in any other vegetable. When blended into a creamy soup, it becomes more palatable to a child who has lost his appetite. Tomatoes are a Vitamin C super food, and the addition of black pepper in this tomato rasam takes its healing power to another level. Black pepper is rich in flavonoids and also has antimicrobial and anti-inflammatory properties. This recipe from Archana’s Kitchen also contains other healing spices like turmeric and cumin. Being easily digestible, apples are among the best foods for babies who are feeling under the weather. This applesauce recipe is easy on the tummy for babies who’ve just started solids and can’t handle anything more complex. Pomegranates are chock full of antioxidants that are crucial when it comes to recovering from a cough and cold. For babies, it can be difficult to eat pomegranate seeds, but this juice should help give them the necessary nutrients of this fruit. 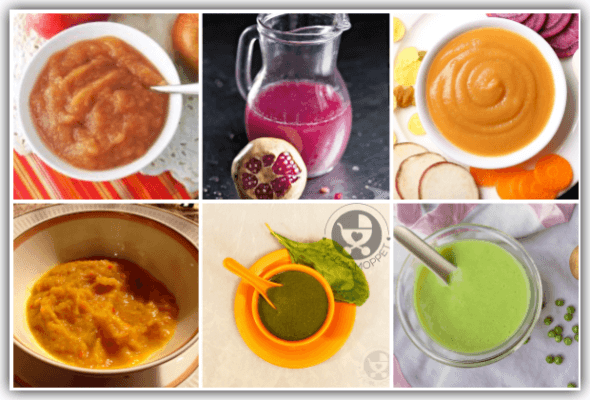 For babies who are still in the weaning Stage 1, a single vegetable puree like carrot puree is perfect. Carrots are loaded with vitamin C and anti-oxidants. This puree also helps to decongest the nasal passage and make it easier to breathe. Sweet potatoes are another vegetable rich in beta carotene, and it has the ability to raise the levels of Vitamin A in our bodies, particularly in children. Sweet potatoes also contain sporamins which prevent oxidative cell damage and promote healing. This puree is one of the best ways to help babies eat these two green super foods – broccoli and spinach. Packed with antioxidants and numerous other essential nutrients, this green puree is an ideal healing food for babies suffering from cold and cough. 70% of green peas are from carbohydrates, which offer a good amount of calories. Most babies don’t eat well when ill, and this can lead to weight loss. This green peas puree can help them regain their strength and reach a healthy weight. Many parents fear giving their babies bananas during a cough and cold, but Kerala Bananas are absolutely safe. Also known as plantains or Nendran, this raw Kerala banana porridge is easy to digest and also helps add calories to the baby’s diet. This pearl millet porridge powder is an excellent gluten free option for babies. With approximately 14% being protein and having the highest folic acid content among all cereals, pearl millet or bajra is also easily digestible for little tummies. Once your baby is onto Stage 2 weaning foods, this porridge is another way to have pearl millet. Combining the rich antioxidants of beetroot and the protein of bajra makes this porridge a great way to promote recovery while providing essential nutrients. Cardamom or elaichi is a spice that has several medicinal benefits. It has antioxidant, antibacterial and diuretic properties and can also help in relieving dry cough and nasal congestion. Since this porridge can be made instantly, it’s also a boon for mothers who have to care for the sick child and have no time to cook. Khichdi is synonymous with fever foods, and is popular across India and across generations. This moong dal rice khichdi is perfect for babies, being easily digestible and having the added protein and nutrients from the mung beans. Once baby has successfully tried apple before, this apple khichdi is a good option for cough and cold. Apples and rice are both easily digestible foods, making this a soothing and easy way to keep babies full. 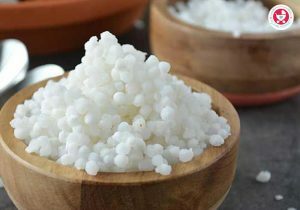 Sabudana or sago is easy to digest and high in calories, which means it’s a great way to help babies keep up their target weight even if they’re not well. This Sabudana khichdi recipe also includes vegetables to make it more filling for babies. This khichdi recipe has a grain, lentils and vegetables, making it a complete balanced meal. 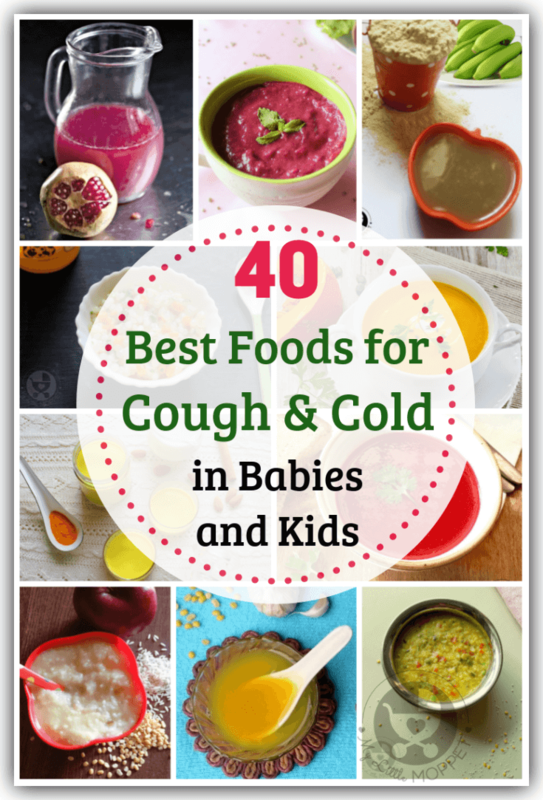 The addition of healing spices like turmeric makes it perfect for babies with a cough or cold. Add some boiled water to make it runnier. 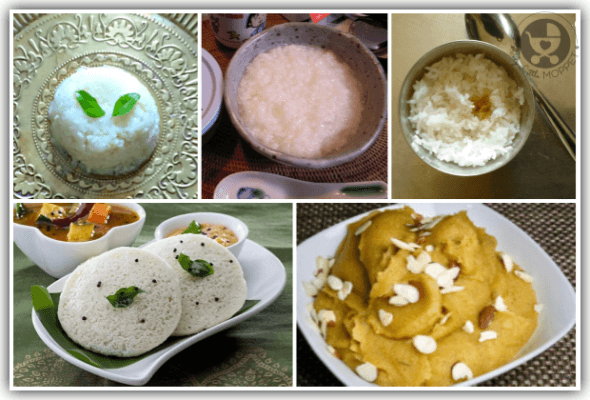 Pongal is an altered version of khichdi, but in a simpler form. It contains ginger, which contains gingerol, believed to possess many medicinal qualities. The recipe also uses cumin, which promotes digestion and promotes healing. 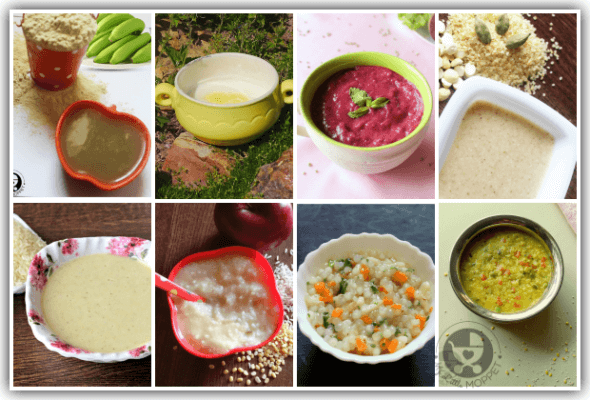 Gruel or kanji is a popular ‘sick food’ across cultures and ages, and for good reason. Rice is slightly overcooked and a lot of the starchy cooking water is retained. This way, sick children get essential fluids along with carbohydrates for energy and calories. Ghee is one of the most popular foods in Ayurveda, and is believed to warm the person from inside. Ghee can also help release congestion besides adding calories to a simple dish like cooked rice. Steamed and fermented foods like idli are easy on the digestive system, and the neutral taste makes it palatable to babies and kids who can’t take stronger smells or flavors when sick. Plain idlis can be offered with plain dal or ghee, to help it go down better. Besan or gram flour has many health benefits, including a high protein content. 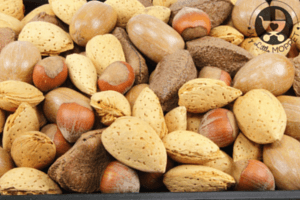 It also contains the Vitamin Thiamine, which aids the conversion of food into energy. 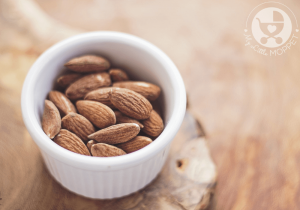 It is also rich in Vitamin B6, which is known to boost the mood and appetite. 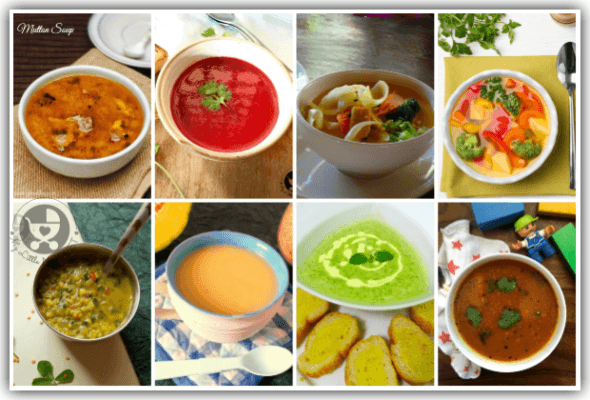 These food recommendations are for the common cold and cough. Please do not consider this as a substitute for medical advice. If your baby’s cough sounds different, or she appears dehydrated, take her to the doctor right away. If your baby is currently on some medication, check with your doctor if any foods are to be avoided. Please avoid introducing new foods when the child is ill and go with familiar foods that you are sure will not trigger an allergic reaction.